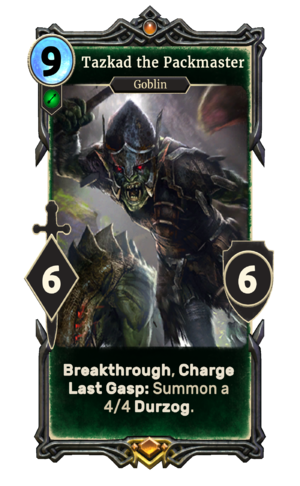 Tazkad the Packmaster is a unique legendary Agility creature card. It is part of the Core Set. This card originally cost 8 rather than 9, but was changed in the 11/2016 update so that it wouldn't be as "consistently devastating" as it used to be. Tazkad the Packmaster first appeared in ESO.